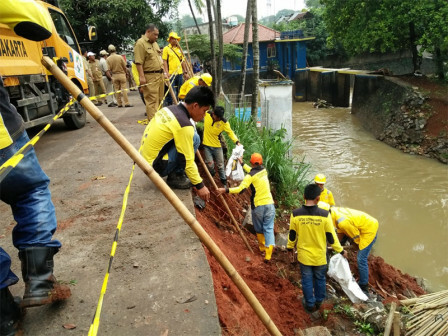 40 joint personnel of Bina Marga Sub-Dept., Water Resources Sub-dept., and PPSU are sent to repair a broken road, precisely at Jalan Tiu, RT 03/04, Setu Urban Village, Cipayung, East Jakarta that landslides after heavy rains on Sunday (11/11) yesterday. "We're making a temporary dike from sandbag piles "
East Jakarta Bina Marga Sub-dept. Head, Juaini Yusuf stated that repair is done to prevent unwanted things in the future. "We're making a temporary dike from sandbag piles. We're awaiting the Water Resources Sub-dept. to install a dolken to avoid subsequent landslides. Afterwards we'll repair the broken part of the road," he expressed, Monday (11/12). According to him, the landslides have made 20 meters of cracks. Besides that the road has also experienced a slope and will be repaired after the bronjong (rocks wrapped in plaited wires) is installed that will take up to one month. "The road must be closed first to avoid casualties. Moreover it looks cracked and tilted," he stressed.